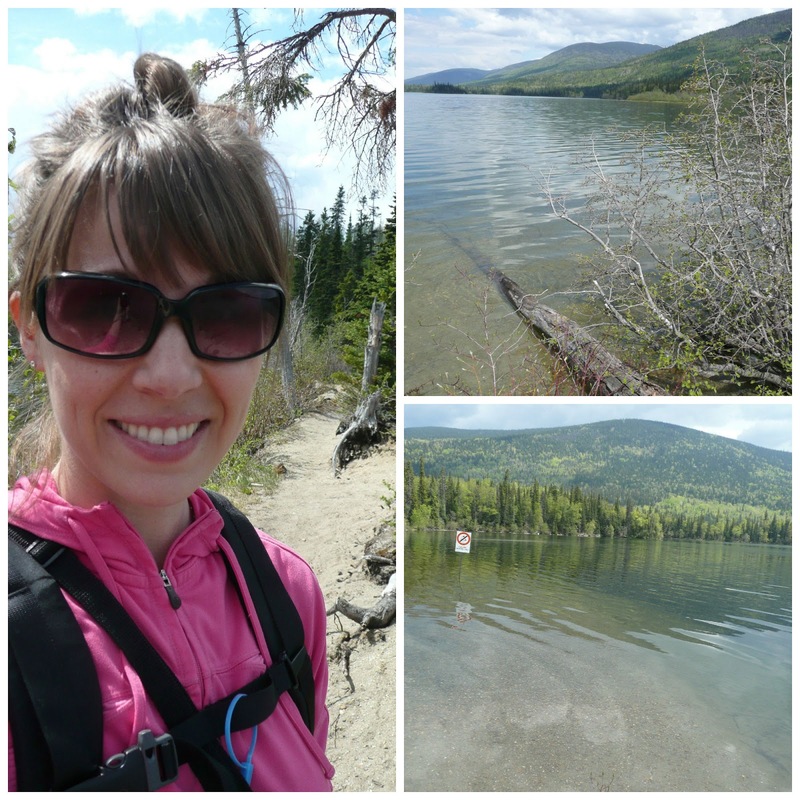 This weekend Keenan and I were able to do some lovely walks through the the trails around Morfee Lake, which lucky for us is 5 minutes away from our house. 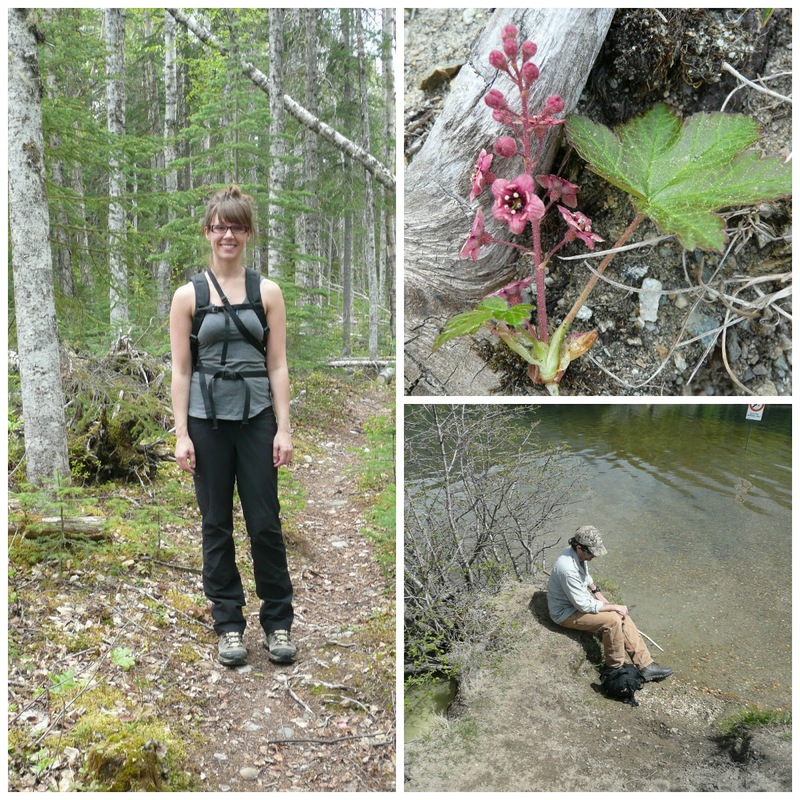 We walked along the woodland trail and collected some Labrador Tea leaves and found a flowering current bush. It is May and at last the North is becoming the place that I love. I love the early winter and the summer. Ask me my opinion in March or April when "The Melting" takes place and you will get a very different answer. Morfee Lake trail is full of many magical little plants all sprouting up right now. In a few weeks there will be little white flowers everywhere. A wild current bush we found, I think it may be Skunk Current. Keenan relaxing by the lake shore at one of our favourite spots to take a dip. Still a little too cold right now for swimming. I feel especially lucky this year as I am able to go for walks and mange modest trails. The last few years at this time my back injury has flared up to the point that I have been bed-ridden and have had to crawl up the stairs in my house... dramatic I know. I try not to talk too much about this on my blog as it is my happy place. But for those who are wondering in 2009 I was riding my bike in downtown Victoria and was hit by a car. I went flying off my bike and had a heavy impact with the pavement. This resulted in multiple fractures in my hand, a very messed up wrist, a cast on for almost 6 months and various other nagging maladies. Despite all this I know I am very lucky to be "O.K" and that I did not get a head injury. I was wearing a helmet of course but braced my fall mostly with my right arm. This accident made my life very different and I to change career paths, look into upgrading and changing the direction of my education and so far ending my time as a competitive athlete. At the time of the accident I was on my way home from work but it was also 2 days before my first Triathlon. I had been training for the Triathlon for 6 months. Anyway I really miss swimming and riding my bike and running of course. Not riding my bike is the hardest as I used to ride everywhere to commute and it is also one of Keenan and my favourite activities to do together. I am very glad I have a lawyer because the case with ICBC the auto insurance company is still ongoing. Who knew it takes 4 to 5 years to be compensated even when you are at zero fault for the accident (I was hit from behind). Anyway I am still waiting on results from a MRI to see what is wrong with my back even though it has been plaguing me for years now. All I know is that since the accident my back has refused to get better. I have to be very careful and I am not able to do much housework or other everyday things one takes for granted. It is suspected that I have a disc injury and/or compressed vertebrae and nerve damage. Currently I am cautiously optimistic that maybe things are finally going to take a turn for the better. I have been seeing a registered massage therapist which has really been helping and now I am able to go on modest walks through the woods and on local trails without too much pain. This is something I am incredibly thankful for and I hope so much that I can make it through the summer without a flare up. It is hard being so enthusiastic about outdoor activities, nature and gardening while having to be very careful of all my movements. Though I have high hopes that sometime in the future I will be able to do more of the things I used to excel at independently. Keenan has been so supportive and helpful through all this, I feel very fortunate to have him. So this is me out and about getting slowly reacquainted with parts of my life that I have missed over the last few years very much. The trail down to the narrows where we like to swim as it is so sandy, and some long views across the lake. Back injuries are no joke. I hurt my back over 10 years ago, and it's still not the same. I remember only making it half-way down my stairs, so I know that dramatic part. Thanks Kim, yes back injuries are a real burden. I am hopeful I am on the mend now. But it is a slow process. Wow, that is so devastating :( I can't believe that happened to you. I hope you find some answers when you get the MRI back. Crazy that the insurance is still on going though -is that normal in Canada to take so long? That's great you were able to get outside and are able to do modest trails now. That place looks absolutely gorgeous! Definitely see where you get inspiration from. Do you go swimming a lot in the summer? I've seen water therapy (think there's a more official name to it) for people with back injuries before and it supposedly helps. Yes unfortunately this length of time is not unheard of at all for a claim to be settled here. Yes I love swimming though I am no longer able to do laps I find when I am in the lake dangling in the water hanging onto a floatation device that it really helps, the traction I guess. I also have an aqua belt for water walking to use at the public pool which I have started doing and it seems to help too. Though I never like the public pool as much as the lake. The whole situation has certainly been a "character building" experience to say the least. I am very thankful for the health that I have and hope very much that I can do more someday soon. That's great you've stayed so positive. Sometimes when people get seriously injured they just let that sadness and pain take over and just kind of give up. It takes so much will power to work through it all. I agree a pool cannot compare to a lake! That's awesome you have one so close by too. We're near Lake Erie which is closed half the summer because of bacteria (heavy rains cause sewage to get into the lake -so gross). WOW! I had no idea! Four years for compensation? That's crazy. Indeed it was a very unsavoury event. I try not to talk about it too much as it has had plenty of "air time" throughout the last few years. Yes four years for compensation, and counting. I am still paying out of my pocket for treatment. I am so thankful I decided to get a lawyer in the beginning because I did not think there would be complications at first. The lawyers office at least paid for all my hand therapy once I had my cast off. If I had not gone 3 or 4 times a week my hand would not have gained full function back, though it will never quite be the same again. That will come out of my settlement when ever things actually get settled!